Daily Illuminator: Have You Ever Wanted A Peek At Game Manufacturing? May 27, 2011: Have You Ever Wanted A Peek At Game Manufacturing? Recently, Mike Fisher of Grand Prix International, our primary printer for all things Munchkin, sent me a batch of photos from his latest trip to the factory in China where Munchkin games are printed. Even though I've been to Hong Kong a few times now, I still haven't made the trip to mainland China for a factory tour, so seeing photos like this is the best way (at the moment) for me to imagine what it's like to be there on the factory floor. I suspect it's a lot like other printing facilities I've visited, but this one would be all the more exciting for me because . . . well, let's be honest and just say that I really want to visit China. You can see the ten photos in this set at Flickr, so if you're at all like me and fascinated by game manufacturing then jump on over and browse around. I think you'll like what you see. 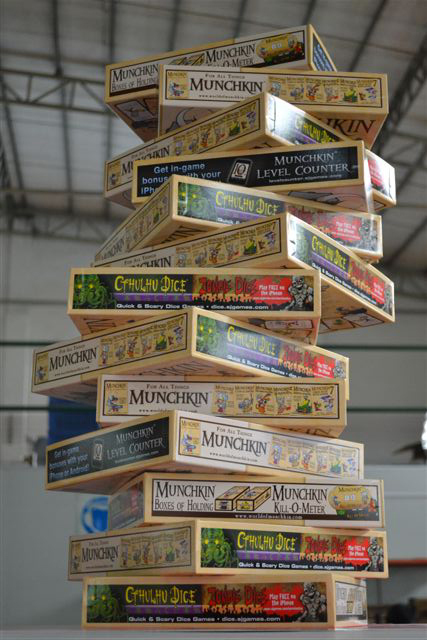 My favorite shot in that set has to be the wall of Munchkin Deluxe boxes, but the Munchkinomicon photo comes in a very close second. That is a lot of cardboard and paper stacked in one place. Rather than flood the warehouse with tens of thousands of copies of Munchkin Zombies, Phil staggered the arrival of the most recent print run. However, Ross now has more orders than he has newly-arrived copies to fill said orders. Don't worry; we have another batch scheduled to land in a few weeks, so your friendly local retailers should have plenty for their shelves. But in the famous words of Martin Brody, we're "gonna need a bigger boat."